Pikas are disappearing from the alpine areas of Great Basin and may be listed due to climate change. People who frequent the alpine areas of Idaho may be familiar with these small relatives of rabbits. 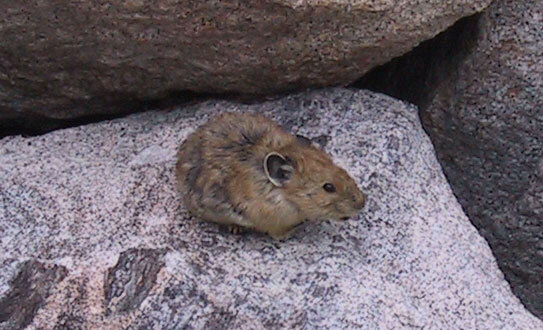 Pikas live in boulder fields where they harvest herbaceous plants and carry them into their dens. You can often hear them calling “eeeep” from these areas. They are very sensitive to high temperatures so, with global warming, their range is becoming more limited. The southern populations suffer from limited habitat which is shrinking due to warmer temperatures and there have been startling losses. This is such positive news! Not to change the subject, but I don’t know where else to post this – please check the DailyKos story regarding the BLM’s plan to allow uranium mining near the Grand Canyon. I had pikas for neighbors when I worked on fire lookouts, and they are way cool. Years before biologists began studying animals by strapping ugly radio collars on them, biologist Adolph Murie simply observed pikas in Denali National Park. Pikas cut various flowers and grasses, bring them back to their little territory, and pile them up for the winter. They carry plants crosswise in their mouth. Murie said it looked like they were delivering a bouquet of flowers to a lover. Cute picture Ken! I love to see and hear these little guys when I’m out backpacking. It’s amazing to think how they can survive at such high elevations through the harsh winters without hibernating. If the pika receives protection, perhaps agencies will have to remove domestic sheep and cattle in high elevation meadows on public lands. Needless to say, domestic livestock compete for the grasses and forbs the pikas need to survive.